God’s promise is to bless the nations. Abraham believed God and became the father of those made righteous by faith, all of us who now trust Jesus. In Christ we are now part of that “great multitude…standing before the throne.” 1 We are called not only to enjoy that blessing but to take it to others. 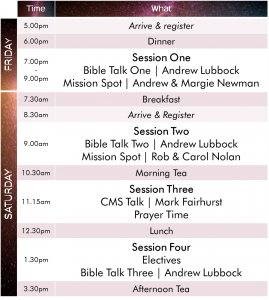 We’re looking forward to another great year at CMS Autumn Encounter as we unpack God’s eternal promises and look at how we are part of His blessing. Andrew Lubbock – Senior Minister of Arundel Presbyterian, Gold Coast. Former CMS Missionary in Italy. Andrew and Margie Newman – Preparing to serve in Uganda. Currently at St Andrew’s Hall. have a chance to catch up with friends over a meal. God’s mission and promises aren’t just for adults; children and youth (12 months to Year 12) will have their own program. During their sessions they will learn about God’s mission in His world and where they fit, while also having lots of fun. Children under 12 months are welcome to sit with you in the program and feeding and change areas will be available.